A labyrinth is an ancient, archetypal pattern, based on the spiral, that has been found in cultures and traditions around the world, with evidence going back over 4000 years. Often in a circular shape, it is a single meandering path to a center and back. The labyrinth is NOT a maze and rather than get lost, the single path can help you FIND yourself. The labyrinth is a metaphor for one’s path in life, and like life itself, is not a straight line, but has twists and turns. Labyrinths have been used as a tool for prayer, meditation and healing for centuries. I like to think of it as a ‘container’ that is a safe, sacred space I can bring my troubles or questions to. The walking meditation one falls into, as you put one foot in front of another, invites the interplay of psyche, spirit and body. As you begin to walk, it is easy to let your daily chattering thoughts, the “monkey mind”, melt away and just pay attention to your footsteps and the motion. This motion and mindfulness, helps people get in touch with their deeper selves, spirit, higher power, their inner being. It allows for knowings, feelings, senses – often shut out from our daily lives – to surface. How does one use a labyrinth? People often report that walking the labyrinth brings them a sense of peace, at the very least – even if no senses, feelings or discoveries bubble up for them. If you cannot walk a labyrinth with your feet, you can use a finger labyrinth that has grooves for the paths that you can slowly trace a finger through, or a drawing of one and walk it with your fingers, or your pen, or your eyes. It is a place to bring a concern, an intention, troubles, prayers or just a place for personal respite that you can take without going too far from your home. I have walked the labyrinth on the Greenway in Boston at rush hour and found the noise and hubbub just fell away as I became one with my walk. Labyrinths can be walked alone, or with a group. When walking with a group, it is helpful to have a facilitator be a friendly presence to answer questions, offer tips to walking with/in a group, and help with spacing of people entering the labyrinth. Walking with a group can be just as profound an experience as walking alone. 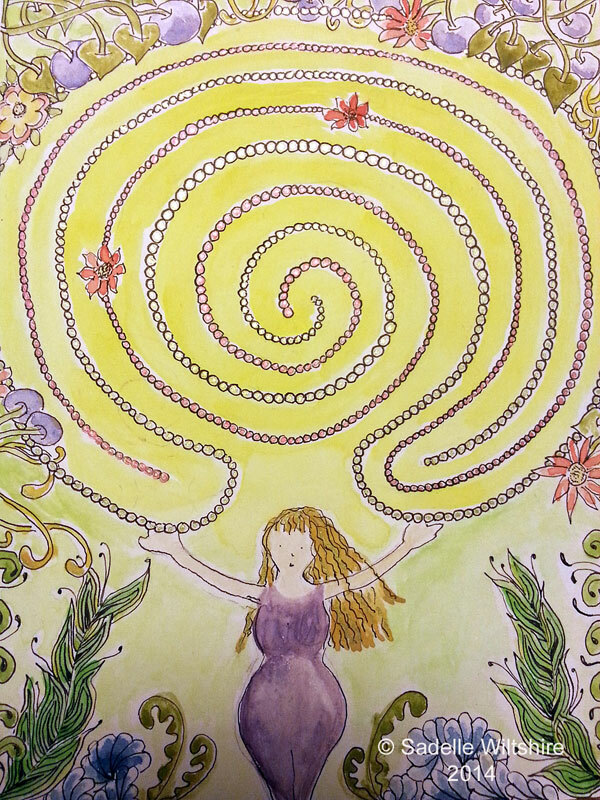 If you walk a labyrinth and feel off-balance, listen to your body and walk it at your natural pace. I had this very experience the first time I walked a labyrinth in my stocking feet. I felt wobbly – and it turned out I was not walking my natural pace, but walking how I “thought” people should be… very very slowly. In fact, when I sped my pace up a bit, the wobbliness went away. You can use the labyrinth as a tool for personal transformation by remembering the three R’s: Releasing – Receiving – Returning. The Release is the letting go of those chattering thoughts and just be as you enter and make your way to the center. The center is a place of Receiving, a place to stop and meditate or let whatever might bubble up inside come clear, and the Return is your path and walk out… and what you might do with what has come to mind (or body) and how you might take that back into the world, or your daily life. But your experience will be different every time, and different for each individual. There is no one right way to walk a labyrinth and it’s ok if nothing happens for you either. It might come to you later, or in a dream, or in your journaling. Let go of expectations and just be open to the experience. Where can one find a labyrinth in their area? Labyrinths can be found in many places, both indoors and outdoors. Probably the easiest way to locate a labyrinth is by visiting the Labyrinth Locator online at http://labyrinthlocator.com/, a joint project of Veriditas and The Labyrinth Society. If you are looking for someone to help facilitate a group experience with the labyrinth, contact www.veriditas.org or The Labyrinth Society, http://labyrinthsociety.org/, and they will be happy to point you to a facilitator in your area. Tell us about your background as a Veriditas-trained Labyrinth Facilitator. I should probably preface this by saying that I am a very newly trained labyrinth facilitator, having just taken the Veriditas training recently, but I am happy to tell you how I got here, and what I hope to do next! I started walking labyrinths about 17 years ago, at a time of great change in my personal life. They say that labyrinths find YOU, more than you finding them, and that has certainly been true for me! 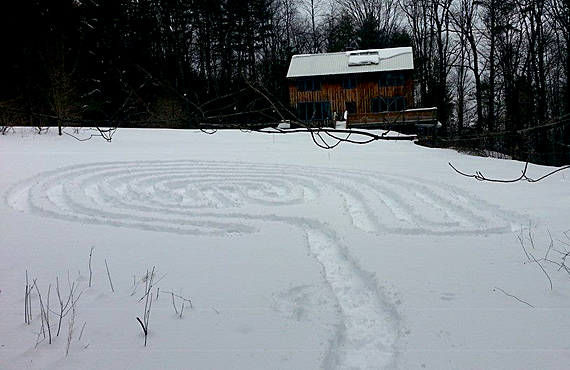 I heard about a temporary labyrinth walk in my former hometown of Bennington, VT, and went, not knowing what to expect. It was a simple mowed labyrinth in the grass, but the experience immediately filled me with a sense of ease. I didn’t have any great revelations that day, just a peaceful feeling. My personal spiritual background is Quaker, and stillness / silent meditative prayer is something that I am drawn to; I also work from home, both as a self-employed web developer / internet consultant as well as a part time (but wanting to be more) artist. So I do a lot of sitting, and the busy-ness of my life often gets in the way of the stillness/meditative part. About 5 years ago I discovered the Zentangle© meditative drawing method during a time of chaos in our lives, and within a year became a Certified Zentangle© Teacher, and the practice alone brought me out of the creative funk I’d been in for years. I was drawing for the first time in years, and considering diving back into my fiber art practice that I’d abandoned long ago. But in the past few years, my aging body has had a hard time with just the sitting and stillness part. In 2013 I found myself drawing and painting labyrinths. I still don’t know why or what inspired this, but I began incorporating them into my meditative drawing practice, and soon into my teaching. As I continued to draw, journal and teach last year, real labyrinths started popping up in my life, wherever I went in my travels all over the US. And I began to have very profound physical and spiritual experiences while walking them. Suddenly I needed to know and understand more – why was I drawn to this ancient form, historically, artistically and spiritually? I eventually learned about Veriditas, and the Reverend Dr. Lauren Artress, who is one of the foremost leaders of the modern labyrinth movement and I was blessed to find a relatively local labyrinth group,plus a new friend and labyrinth colleague, Debbie Yaffee. After much soul searching, I chose to attend workshops and facilitator training with Dr. Artress and Veriditas at Trinity Cathedral in Cleveland, Ohio, in November, 2014. I am excited to continue to offer my spiritually-aware art workshops but can now offer embodied, experiential labyrinth walks using pen, fingers AND feet! I have also begun to journal again…. a practice that has become increasingly UNstuck for me as I allow myself to take the journey inwards that the labyrinth has to give, and am so looking forward to sharing the healing gifts of the labyrinth with my community, students and beyond. 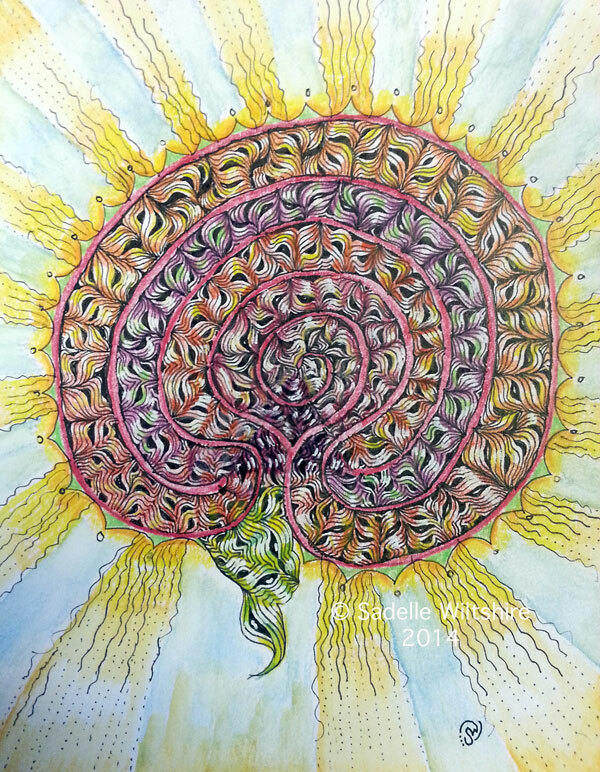 Sadelle Wiltshire, of Putney, Vermont, is a fiber artist / teacher, web developer, Certified Zentangle© Teacher, and a Veriditas Certified Labyrinth Facilitator. She can be found at www.tanglevermont.com or www.thetangledlabryinth.com.